We are counted as consistent firm actively involved in manufacturing and supplying superior quality Tie Paper Boxes. Made from premium grade cardboard material, these boxes are ideal for packing ties. These boxes come with an easy to use lid and laminated with black craft paper, which makes them a value for money product. To meet the variegated demands of our clients, we are into presentinga quality assured range of Tie Boxe to our clients. 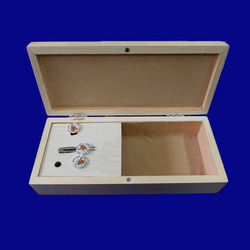 Offered Tie Boxe is manufactured under the supervision of experienced professionals using modern machinery. We can also customize these products as per the client’s requirements. 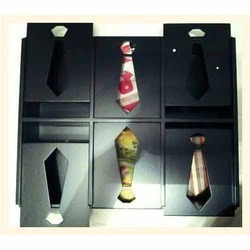 Our company is among leaders for offering best quality Ties Wooden Packing.These packing boxes are made available in different sizes. We are looking for bulk enquiries.Note : Prices of products are Approximate and completely depends upon Design and Buyer Requirement.